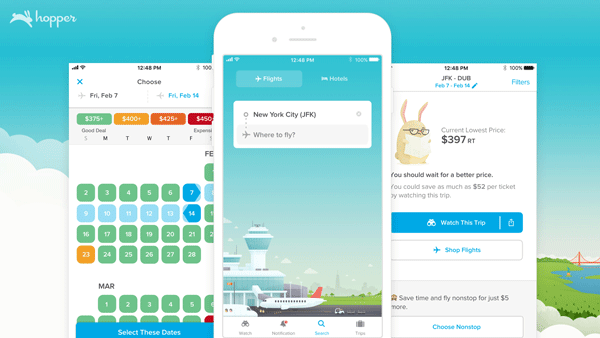 Hopper, the leader in mobile-only travel booking, announced that this year it will begin the process of internationalization in earnest on the back of a recent $100 million USD financing round. Currently available in 126 countries – and the #1 travel app in over 37 of them – Hopper enjoyed significant international traction in 2018 and plans to accelerate that growth in key markets this year, with 25% of ticket sales already originating outside of the United States. Early yet significant product improvements, such as the inclusion of nearly 50 low-cost carriers in Europe, have led to pronounced growth in the region, with sales up 154% YoY. International expansion priorities include language, currency, and pricing localization. In 2018, Hopper scaled its hotels offering from 1 beta market to 30 top markets with 6,000 hotels. Later this year as Hopper continues its international push, it will be possible to book accommodation in-app in nearly every city worldwide. Hopper also passed $1B in sales in 2018 and has been downloaded over 35M times. More than 95M trips have been planned in the app to-date, and over 150,000 new trip watches are being added every day. Watch Hopper’s CEO and Co-Founder, Frederic Lalonde, on the Banco Sabadell Keynote Stage at Mobile World Congress 4YFN this Wednesday, February 27 at 4:40 PM, where he will discuss the future state of travel as the world continues its shift to mobile. And, stop by Hopper at ShowStoppers to learn more about upcoming product features and international expansion news coming in 2019. Hopper will host a Q&A with Consumer Travel Expert Liana Corwin at its booth to discuss industry trends, the latest data, and how consumers are being impacted.